Last April, I wrote about the Victoria and Albert Museum’s wedding photo archive. Today, I received a comment from Kelly Joy, who found the post and saw her own wedding photo on this blog! After just over a year of writing in this space, I have been reflecting upon what else I want to do here (this is the reason you haven’t seen a flurry of posts from me, lately). Kelly’s comment was a nice reminder for me about how a medium like this one can connect you with someone across the world, as easily as it can with someone across the street. She shared her photo with the V&A. I came across and it immediately smiled at the joy emanating from it, so I shared it with all of you. She came upon it over a year later and reached out to me. The thread of that brilliant fuchsia dress has woven a path. It shows you how small the world is and how connected we all are. To some, fashion can be frivolous. To the rest of us, it can be symbolic, powerful, it can mark a time in history, it can transcend borders and limits, it can make you gasp with joy or disbelief. Ask a woman about a dress and she will tell you a story about a part of her life. And isn’t sharing our stories what life is all about? Upon reflection, it seems our dresses come with stories. 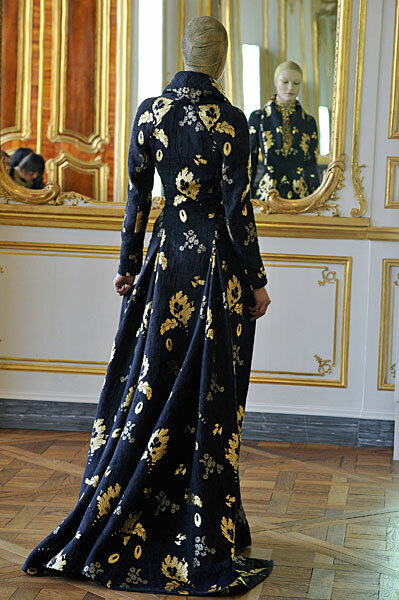 McQueen's brilliant gold and black coat dress from his final collection. Previous Post Frock, Frock. Who’s There?